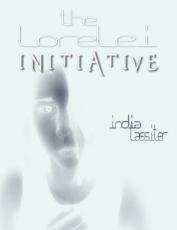 These are the first two pages of my novel, The Lorelei Initiative, which I began writing November 2009 and finished May 2011. It is 364 pages, and science fiction-fantasy. I am in the process of editing it now. In Lorelei, there are Walls wider than houses and taller than skyscrapers, and their lengths divide up the city between the privileged, the merchants, the average citizens, and the slummers, criminals who completely occupy the ghetto. Rat, an indentured thief, was born on the wrong side of the Walls, where once-mighty buildings have crumbled and grown a coat of filth and crime; where the corrupted police, the Minders, arbitrarily weed out the population; where everything, even family, has a price. Rat was made to be a criminal, his mind and body trained and modified to succeed in a cutthroat world he hates. Li was born in a place without Walls. She can remember only a bright light, and then waking up in a laboratory. She hazily remembers being tested, examined, and observed for her first days of life, caged by scientists who seem fascinated by the mysterious white fire she can produce from her hands when frightened or angry. However, with a level of consciousness unexpected to her creators, she learns to use her power and shatters her glass prison, then escapes. She mistakenly flees into one of the worst slums of the city—Rat’s home turf. When circumstances make Rat reach out to Li in a rare moment of impulsive compassion, suddenly they are both in over their heads, hunted without rest by the government’s Minders, their strange weapons, and their machine-human hybrids all the while avoiding gangs looking for Rat. Everyone desires Li’s strange abilities to heal, blast, and teleport, but their use threatens her life and sanity. She understands little of her strange nature, and Rat seems to be the only person she can trust as they journey through a broken city, one desperately needing her help.